Forecasts for the first change in interest rates since 2009 have been pushed further into the future following the latest reports from the Bank of England. The Bank said that the outlook for global growth had weakened, which was depressing the risk of inflation. Economists think that indicates rates will not rise until the second quarter of next year and perhaps later. The Bank once again held UK interest rates at the record low of 0.5%. The Bank's Monetary Policy Committee, led by governor Mark Carney, voted 8-1 to keep rates unchanged. UK interest rates have now remained on hold for six-and-a-half years. In its quarterly inflation report, the Bank of England said "the outlook for global growth has weakened since August". It blamed emerging market economies for that weakness, saying growth in those regions had "slowed markedly". While the Bank expects inflation to to rise above its 2% target in two years, it says that risks "lie slightly to the downside" during that time period. In other words, inflation may not rise as quickly as the Bank forecasts. Mark Carney gave what many would see as a bum steer in July that interest rates would be going up around the turn of the year. The implication was unambiguous: we should prepare for the end of the era of near-zero interest rates, that has prevailed since early 2009. Well today the Bank of England gave an equally unambiguous signal that the moment of truth for an interest rate rise has been delayed by ten or 12 months, to the latter months of 2016. For City traditionalists, Mark Carney's predilection for giving so-called "forward guidance", which seems to date to have habitually gone awry, may have damaged his authority a bit. In what has been dubbed Super Thursday, the Bank released its quarterly inflation report and minutes from its previous policy meeting as well as the latest decision on interest rates. The minutes revealed that for the third month running, Ian McCafferty was the only member of the Monetary Policy Committee to vote for a rise in interest rates. In a news conference, Mr Carney described the UK economy as "robust" and "resilient". However, the weakness of the global economy, particularly emerging markets, has made the Bank of England cautious about the outlook for inflation. Lower costs for energy, food and other imports are likely to keep consumer price inflation below 1% until the second half of next year, according to the Bank. Economists are saying that the latest reports indicate that the Bank of England remains relaxed, or dovish, over an interest rate rise. "This is a lot more dovish than most people were expecting," said Paul Diggle from Aberdeen Asset Management. "That magic first rate rise has been kicked into the long grass once again. Only a few months ago, the Bank was saying that inflation wasn't picking up because of the low oil price. Now it's emerging markets. You have to wonder what their next reason will be," he said. 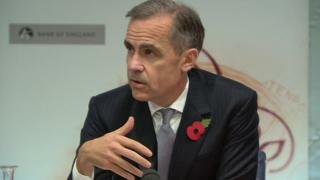 In the news conference, Mr Carney was asked about the continued rise of house prices and unsecured credit growth. He said he was "conscious" of those moves, although he pointed out that standards of lending in the housing market had improved and the number of distressed households had continued to go down. But the Institute of Directors (IoD) said there was cause for concern. "There is genuine apprehension over asset prices, the misallocation of capital and consumer debt," said the IoD's chief economist, James Sproule. "Borrowing is comfortably below the unsustainable pre-crisis levels, but with debt once against rising there is a need for vigilance. "The question is, will the Bank look back on this unprecedented period of extraordinary monetary policy and wish they had acted sooner? The path of inaction may seem easier today, but maintaining rates this low, for this long, could prove a much riskier decision tomorrow," he said. Despite that concern, most economists do not see a rate rise until well into next year. Howard Archer, chief UK economist at IHS Global Insight said: "The first interest rate hike from 0.50% to 0.75% is still most likely to happen in May 2016 - but the risks now seem to be that the increase could be later than this rather than before it. As things currently stand, an interest rate hike in the first quarter of 2016 looks unlikely". Vicky Redwood, chief UK economist at Capital Economics, takes a similar view: "As a result of all today's announcements, we are comfortable with our view that rates will rise in Q2 next year (and subsequently increase very slowly)". Peston: Is Carney hurt by wrong rate steer?